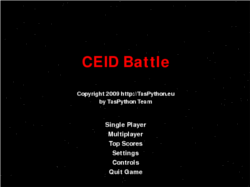 This is a game developed with the TasPython Team, in which, the students of CEID (Computer Engineering & Informatics Department at the University of Patras) are fighting with the department’s professors. The game can be played from one or two players. A cool feature of the game is that if the user has upload his avatar (that uses at department’s forum) at the Diogenis Server, he can play with it by just typing his username. To learn more or download the game please visit this link.